Roasted Beets has become one of our favorite side dishes. 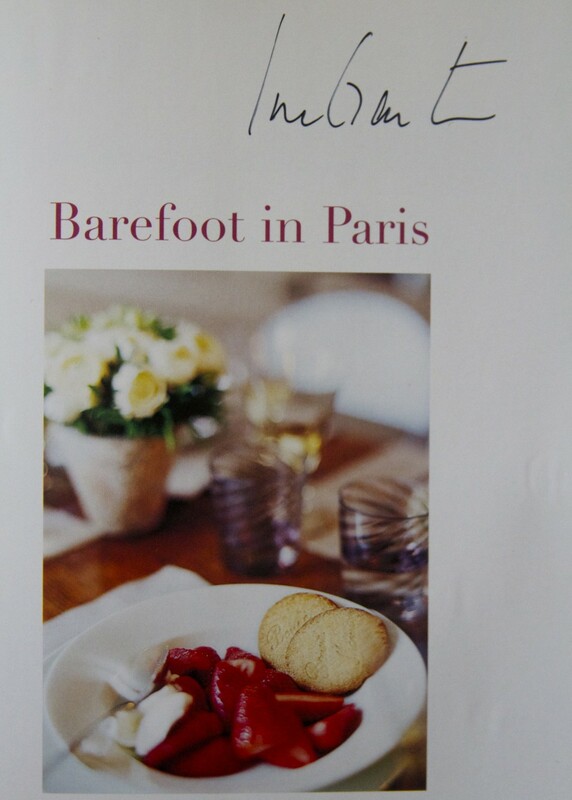 The first time I roasted beets myself was several years ago after purchasing Ina Garten’s cookbook “Barefoot in Paris”. 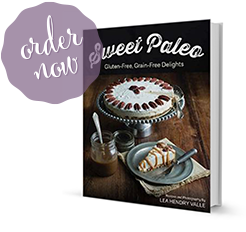 Before going Paleo it was one of my favorite cookbooks. In fact, I liked it so much I stood in line for quite a while to meet Ina and have her sign my copy. See, I’m seriously a fan! 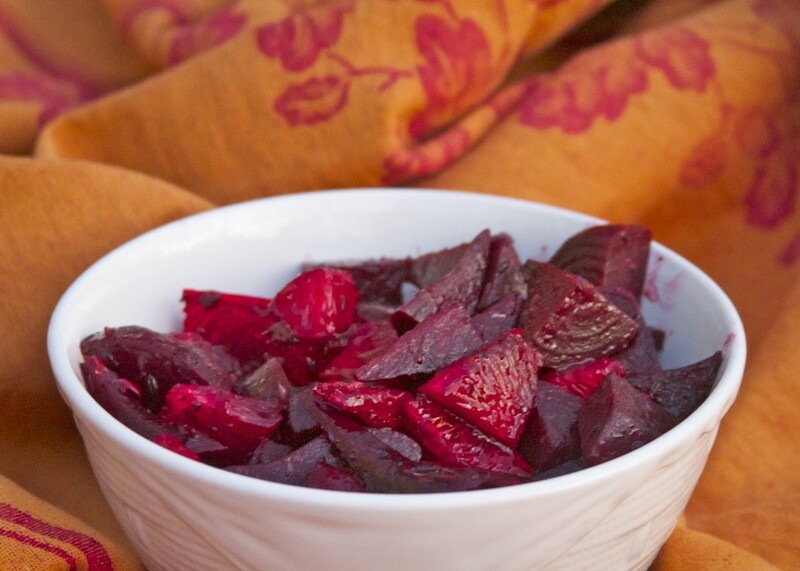 There are still a few recipes in that cookbook that fit with a paleo diet and roasted beets is one of them. I love beets. See how gorgeous they are. I think they like having their photo taken. Along with being beautiful, beets are highly nutritious. 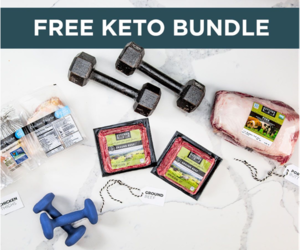 They are a unique source of phytonutrients called betalains which provide antioxidant, anti-inflammatory, and detoxification support. 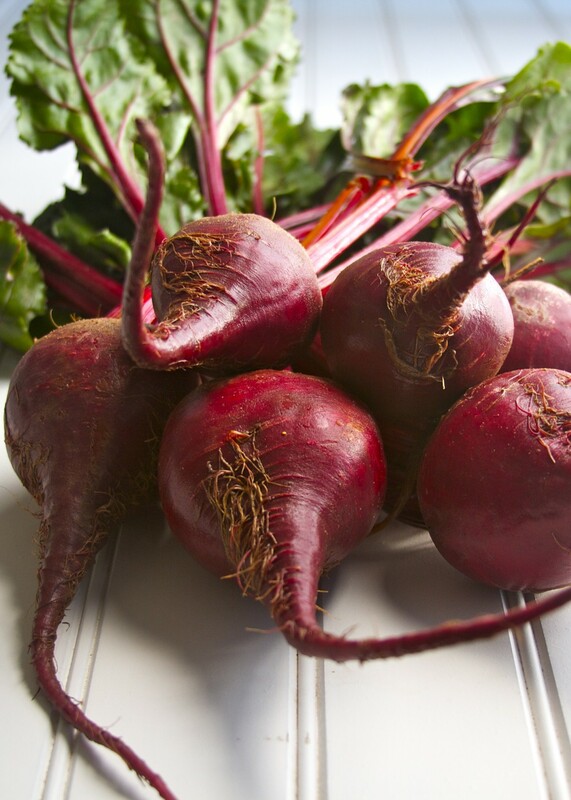 Beets also contain high levels of potassium, manganese, Vitamin C, iron, folate and fiber. They can be eaten raw – check out my recipe for Beet and Cabbage Slaw. You can also eat beet greens – check out this recipe for Beet Greens Sautéed with Bacon Fat and Garlic. 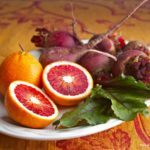 This recipe for Roasted Beets with Blood Oranges uses Ina’s basic recipe with a few changes including the incorporation of blood oranges. 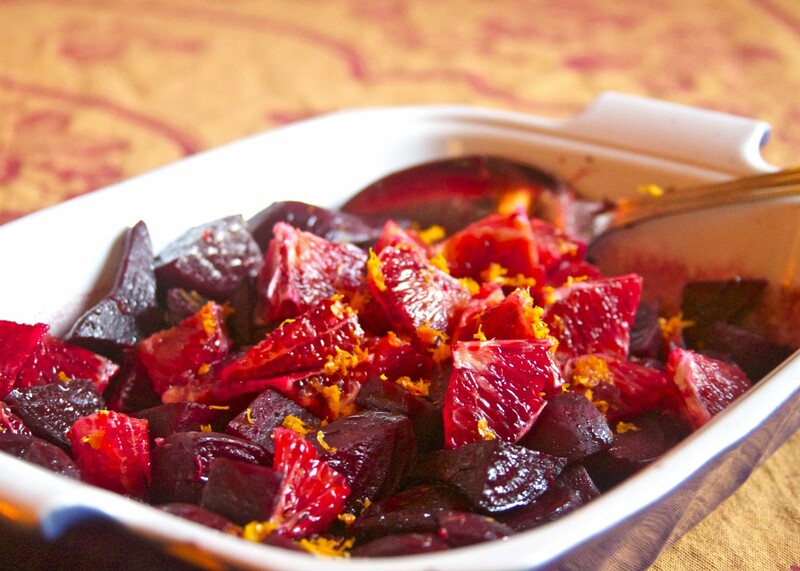 I love how the hot, roasted beets compliment the cool, tangy sweetness of the oranges. You can certainly use regular oranges and, in fact, the orange and red contrast is really lovely. 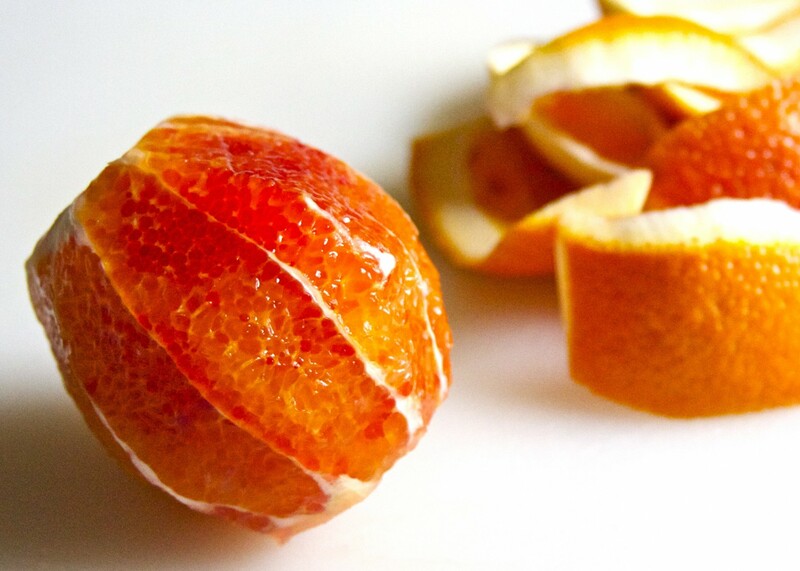 But if you have the good fortune of access to blood oranges then the flavors and colors are even more amazing. Remove the tops and roots of the beets and peel each one with a vegetable peeler. Cut the beets in 1 1/2 inch chunks. 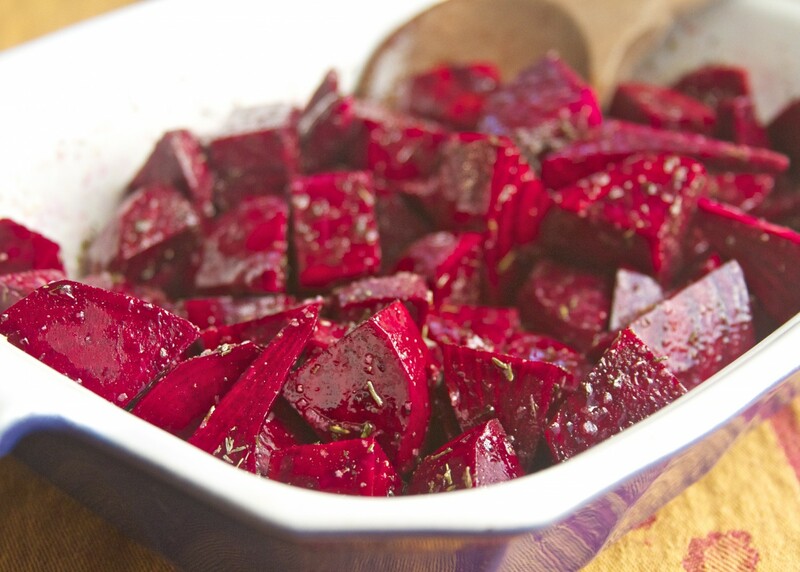 Place the beets in a baking dish and toss with the olive oil, thyme, salt and pepper. Roast in the oven for 40 minutes, turning once or twice with a spatula, until the beets are tender. While the beets are roasting, zest one of the oranges and set aside the zest. Juice that zested orange to get approximately 1/3 cup of juice, set aside the juice. 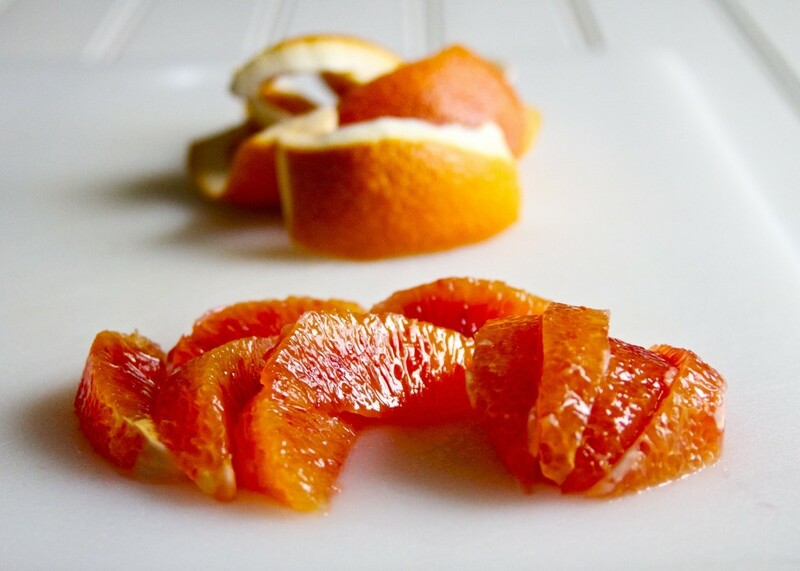 Use a sharp knife to create orange segments out of the remaining two oranges. Cut both ends off the oranges. 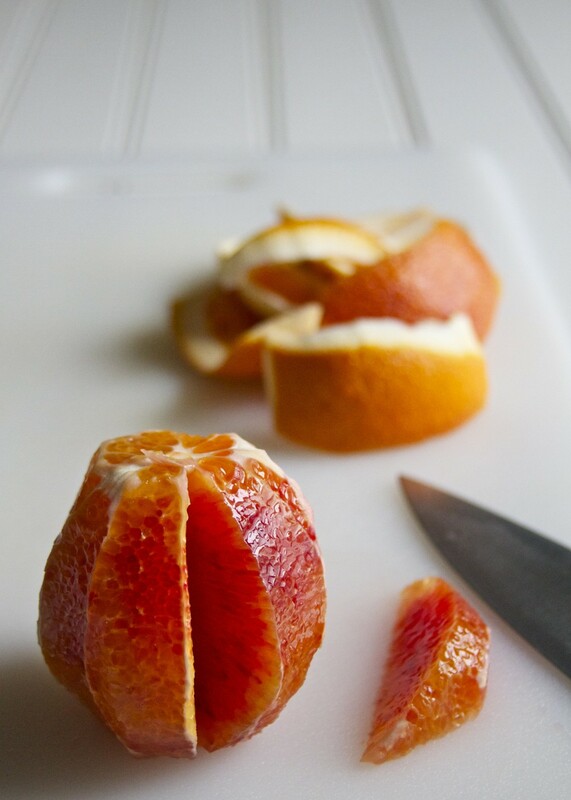 With the orange standing on one end, use your knife to cut off the peel, exposing the flesh of the orange. Cut all the way around until you have a completely bare orange. 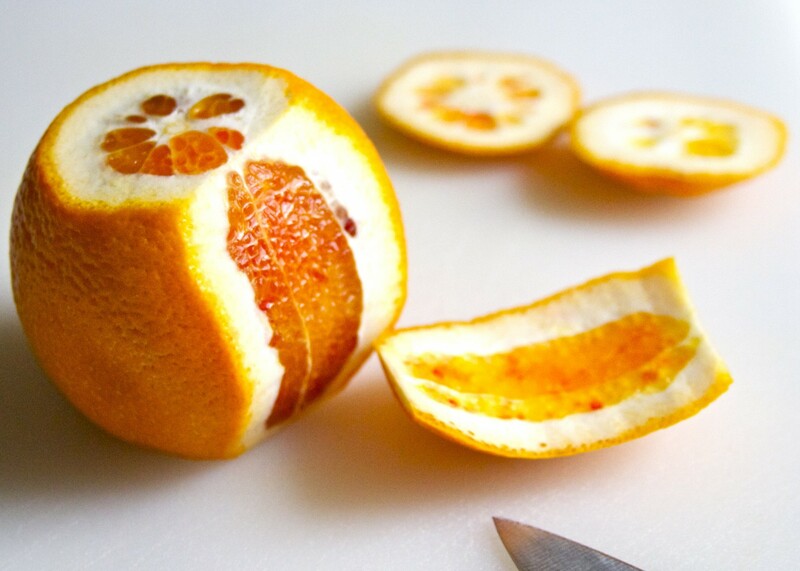 Use a very sharp knife to cut segments out of the oranges. When the beets are tender, remove from the oven and immediately toss with the vinegar and orange juice. Add the orange segments and orange zest. 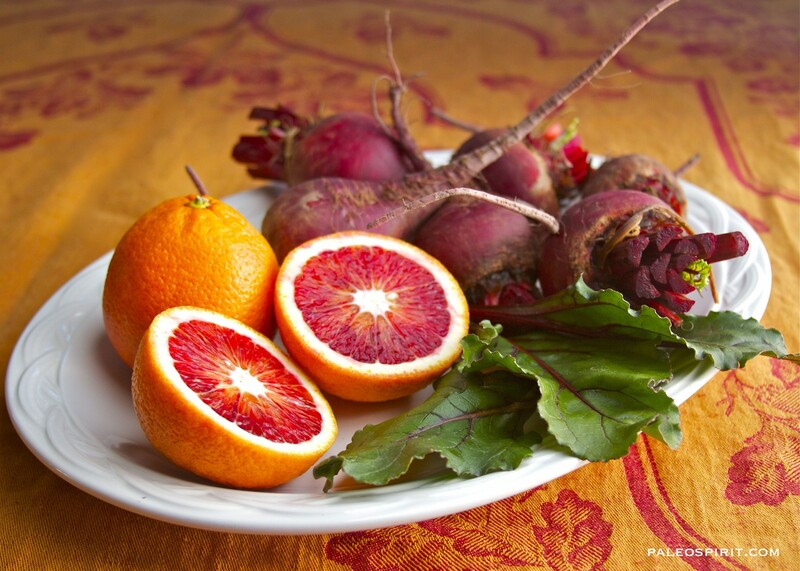 Roasting beets and pairing them with blood oranges creates a gorgeous, as well as highly nutritious, side dish. Eating beets can cause, for 10-15% of the population, a very strange phenomenon. I’m not going to tell you what it is but if you try this recipe you may discover it for yourself. 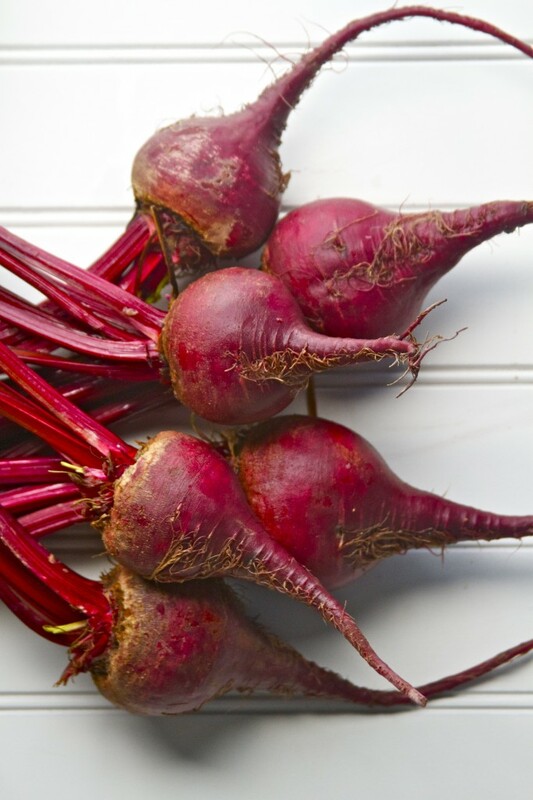 Here’s a hint, notice the deep, deep red color of these roasted beets! Continue cutting inside each membrane until you have all the blood orange segments. 11 Responses to "Roasted Beets with Blood Oranges"
this looks like a beautiful dish but what main course would you pair it with? I think this dish would go well with lots of different meat dishes. Roasted chicken sounds especially good because you could use some thyme as part of the chicken seasoning. That would pick up on the thyme in the beets recipe. It might be good with a sausage dish -especially if it was sweet Italian sausage that had fennel seeds in it. I always think fennel and oranges go well together. Thanks Patty. The camera loves those beets and oranges! I’ve made this several times and love this recipe. Thanks! 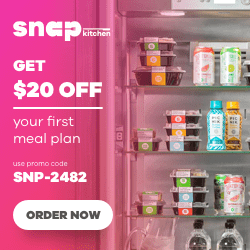 Great to have in the fridge for a quick snack, salad topping or side dish. I used orange and red beets.